You got swindled. Hornswaggled. Flim-flammed. Took. You, and the rest of America, have been sold a bill of goods – one that has convinced you that cooking is hard, expensive and time-consuming. We don’t have so much of a food problem in this country as we have a cooking problem. People have become convinced that cooking is a chore, but it’s not. It’s the most tangible way we have to demonstrate our love to our family and friends. It’s one of the things that separates us from the rest of the animal kingdom. It’s a sacred act, not a chore. And it should be given the due reverence that it deserves. With an understanding of the basics, you can cook beautiful food at home. Find the recipes for these appetizers and more at frontiercoop.com/holidays. That said, there are some basics to learn, a foundation on which to build your skills. In fact, the word “foundation” comes from the same Latin root as the French word “fond,” meaning “stock” or “broth,” which in turn is the basis of all of Western cuisine. The basics of how to make a stock are important, as are knife skills – nothing saves more time in a kitchen than efficient knife skills and sharp knives. It’s vital to know the fundamentals (there’s that Latin root again) of cooking technique: the difference between roast and braise, sauté and fry, etc., and it’s helpful to understand a little bit of the science behind what happens when food meets heat. None of this is rocket science. I can assure you that if it were, I would not have been successful in the industry for 35 years. There is a reason, after all, that we have the expression, “Easy as pie,” (because making pie is indeed easy). Unfortunately, we’ve taken that essential role of preparing food for our families, of nourishing our loved ones and demonstrating that love, and we’ve outsourced it to distant, often foreign, factory farms. If we are what we eat (and we are), then most Americans are fast, cheap and easy. And it’s what has lead to the overwhelming epidemics of obesity, diabetes and other diet-related diseases in the United States. Statistics tell us that an American child born after 2000 has a 1 in 3 chance of developing diabetes. Among minorities that rises to 1 in 2 (source). Just as insidious, though, is the way this fast food culture has permeated our American culture. Many great organizations, such as Slow Food USA, are trying to mitigate the deleterious effects of this. Even still, we continue to need a “firm defense,” a way to “preserve us from the contagion of the multitude who mistake frenzy for efficiency,” as the Official Slow Food Manifesto put it. Why is the craft of cooking important to you? 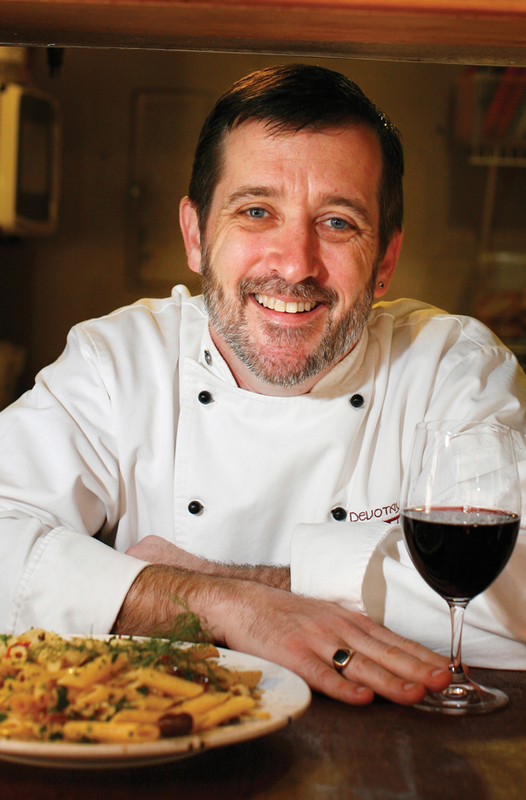 Join us on Frontier Natural Products Co-op’s Facebook page on Thursday, Dec. 5, 2013, for a Facebook chat with Chef Kurt from 8-9 p.m. Central! Chef Kurt will answer your questions about holiday cooking and baking. To participate, simply post your question in the comments of the kick-off post around starting around 8 p.m.
About the Author: Chef Kurt Michael Friese graduated from the New England Culinary Institute, where he also served as a Chef-Instructor. With 34 years of professional food service experience, he has been chef and owner, with his wife Kim McWane Friese, of the Iowa City, Iowa, restaurant and bar Devotay for 17 years. Chef Kurt is partnering with Frontier and Simply Organic to bring you recipes and tips for rediscovering and reinventing your own traditions this holiday season. Find more recipes at frontiercoop.com/holidays and simplyorganic.com/holidays or watch cooking videos on YouTube. I’m enjoying your series immensely. Thanks for the knife tip, I’m looking forward to investigating Gethman Knifeworks and buying myself a sharp holiday gift. One small thing I would question is the need for antibacterial soap on a wooden cutting board. Excess use of antibacterial soap may or may not encourage resistant bacteria, but I don’t think there is much evidence it actually does anything to create safer food preparation surfaces. Wash, rinse, air dry thoroughly should be more than sufficient to avoid concentrations of bacteria high enough to cause problems in a home kitchen.